Puppy grooming has many benefits, it ensures healthy growth of the coat, promoting good blood circulation. For longer haired dogs it helps prevent matting which if left will form thick matts which become sore and heavy. 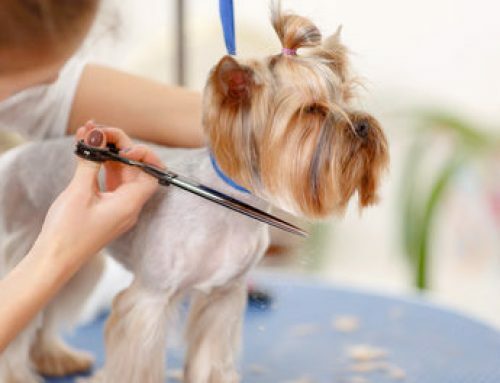 Grooming also enables you to have a thorough check of your dog, giving him/her a once over to check for any other changes or potential problems (lumps, bumps, parasites, or scratches). Grooming also encourages bonding between the owner and dog as well as helping to relieve stress. When should you start introducing puppy grooming? As soon as possible. The earlier the better. You need to build up their confidence so that they see grooming as a pleasurable experience. Start off by giving them a cuddle while you brush them gently around the body. Try to Find somewhere quiet where your puppy can relax. Give them lots of praise and, after a couple of minutes, stop brushing and offer them a treat. If your puppy attempts to bite or play with the brush, turn away but don’t let go. Don’t tell them off as this can result in the dog associating grooming with a negative experience. Equally, you don’t want to turn grooming into a game, so ignore negative behaviour and praise good. Groom them several times a day, gradually increasing the length of brushing time. After several days you can start brushing new areas such as their belly, tail, ears and other sensitive areas. For a dog that will need regular grooming including a salon its good to introduce them at an early stage. This way they can get used to all the sights and sounds of the salon. Pop into the groomers to meet them and for you to have a look round. Following this book them in for a puppy package. Here at Maisie’s we offer several puppy packages. The first is a simple bath, dry, brush and perfume spritz the second also includes a slight trim around their sanitary areas to help keep them clean and tidy. To book in simply call 01527 43 44 45.